Clash of the Titans is a splendid route. That was my first climb of such a difficult ice line. Using an ice axe and crampons on overhanging ice is really challenging and at first glance I felt the ice crumbling in front of my eyes. Adapting to the Canadian cold was also tough, with temperatures reaching minus 30° C. Under such circumstances, climbing mixed routes is truly demanding. Your muscles are constantly cold and contracted, your hands, enveloped in thin gloves, immediately feel frosty and, when the blood flows back to them, the pain is so strong you’d feel like crying. The boots are light and tight fitting, the crampons are attached to the boot and you can tackle difficulties that were once unthinkable, if wearing sturdier boots with crampons. It was clear right from my second attempt that the route was doable and I was getting more and more familiar with this type of climbing. Helmcken Falls is a fabulous place, which still has a lot to offer in terms of routes and difficulties for the future; nobody knows exactly where the limitations of dry-tooling actually lie. If you want to climb lines such as this one, you’ll need experience and good instincts, as the ice is constantly changing and the temperature relentlessly varies the route. 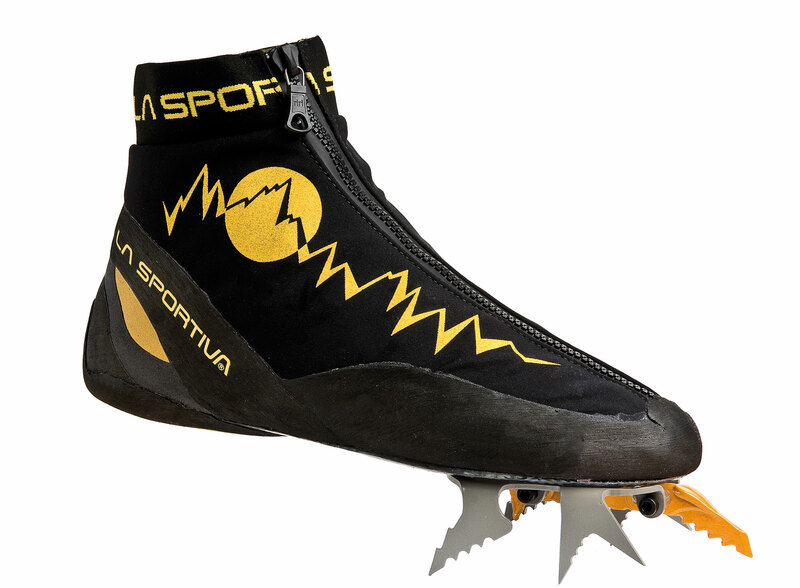 The Mega Ice Evo shoe, conceived for dry-tooling and extreme ice routes, integrates three essential elements for the ascent, which were once separated from each other: shoe, gaiter and crampon. It’s akin to an ever-evolving shoe-lab, closely following the technical progression of athletes towards the still unknown limits of this speciality. A carbon insole sporting thread inserts stiffens the structure and allows it to fix the Black Diamond Raptor crampon directly to the shoe.